Keep in mind that everything is due to change next year—with the introduction of an all-new 4-cylinder engine lineup in some, if not all, Cayman models. Buy now if you love the flat-6. The 2016 Porsche Cayman has been living in the shadow of the more expensive 911 sports car—Porsche's flagship—but in many respects it's a better, more focused sports car. Although we might choose a 911 to take on a long touring trip, we'd probably rather choose a Cayman to drive, and blast down backroads and canyon highways—and that says something about how these two models have evolved. The Porsche Cayman is, like its soft-top sibling, the Porsche Boxster, a mid-engined sports car with some of the best balance, poise, and maneuverability on the market. Across the lineup you'll get the best, most accurate and nicely weighted steering, too. With a choice of three powertrains, it vies for a pretty wide swath of devoted driving enthusiasts, too. The base Cayman uses a 2.7-liter flat-6 rated at 275 horsepower; the Cayman S gets a 3.4-liter flat-6 good for 325 hp; and the GTS, new at the end of last year, gets a 340-hp version of the 3.4-liter. Six-speed manual and 7-speed PDK dual-clutch transmissions are available for all models. When equipped with PDK and the Sport Chrono package—which you'll want to get launch control—the base Cayman accelerates to 60 mph in just 5.1 seconds, the Cayman S makes the run in 4.6 seconds, and the Cayman GTS manages it in only 4.5 seconds. The Cayman GT4 joins the lineup for 2016. 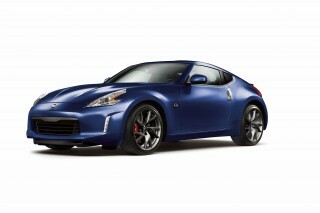 It's a lean, focused road racer edition, coming with a 3.8-liter flat-6 delivering 385 hp. Drive goes to the rear wheels via the aforementioned 6-speed manual, and this model can get to 60 mph in just 4.2 seconds and top speed is 183 mph. And to illustrate how fast they've managed to tune the Cayman, you can take Germany’s Nürburgring with a time of 7:40, which is comparable with times set by the 997-series 911 GT3 and even Ferrari’s 430 Scuderia. The Cayman is just a great-looking sports car, too. Smooth, flowing curves sweep up from the low nose over the fenders and into the teardrop roof profile. Muscular haunches rise at the rear, wrapping around the simple, tidy tail. Inside, the Cayman is all modern Porsche, with clean lines and smooth surfaces broken up only by the center stack and its button-filled controls. The base Cayman comes with a decent set of standard equipment, in a luxury sense, but all the standout appearance or performance-improving options are extra. Some of the highlights of the options list include: a choice of three different steering wheels, one with multi-function audio, phone, and navigation controls; a choice of three seating options, including the standard sport seats, power sport seats, and adaptive sport seats with available heating and ventilation; a leather interior package to enhance the look and feel of the dash, doors, and more. There's also a Burmester audio system with 821 watts and 12 speakers. Cayman GTS is outfitted much like a Cayman S with lots of boxes checked, and at a comparative discount to an S with nearly all of the a la carte options tacked on. In base trim, the Cayman is EPA-rated at 20 mpg city, 30 highway, 24 combined with the manual gearbox, or 22/32/26 mpg with the PDK dual-clutch automatic. The 2016 Porsche Cayman is a very good-looking sports car—maybe even better-looking than the 911. 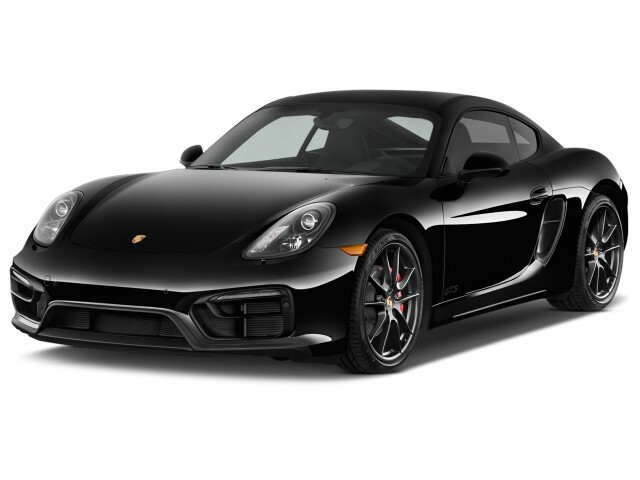 The Porsche Cayman was redesigned for 2014, and it's carried over since then with an expanded lineup of variants but very few serious visual changes—just a few new colors, and more wheel and trim choices. The Cayman's cabin—and its instrument panel in particular—is almost identical to its roadster sibling and very similar to the larger 911. A clear and driver-focused instrument and dash layout give way to a tight grid of buttons; while it's a bit busy in places, it's straightforward, clearly bearing an engineer's touch as well as a stylist's. There's something to be said for the presence of hard buttons for things in the Cayman. While most other brands bury everything imaginable in touch-screen menus, Porsche still likes buttons. It brings a slightly more cluttered look, but it's worth it. At the risk of sounding like we're taking the easy route here in trying to describe the Cayman's exterior, we'll say that it simply is what it is—a coupe version of the splendid Boxster roadster—only the Cayman ends up taking on some proportions and nuance of its own in the process. Like the Boxster, the current Cayman is more angular, crisp, and cleanly detailed than its predecessor. That's especially highlighted in front, where the low nose is framed by rising fenders, with a taut passenger bubble sloping gently toward the tail. An integrated spoiler bridges the muscular rear haunches and includes a third brake light. In the Cayman, the sheet metal and aggressive front aero work altogether, with the roofline, makes the front end of the Cayman a bit of a tucked-down look. Somehow the visual trick is that it appears just a bit more rakish and wedge-like than the Boxster—and we're definitely not complaining. In all, this is one of the best-looking sports cars on the market, one that much of our editorial team would choose (with styling definitely part of it) over the 911. In any of its versions, the Cayman is a love affair from the driver's seat, with unflappable grip, sonorous acceleration, and nothing uncouth. The 2016 Porsche Cayman delivers a whole lot of driving pleasure; and whether you prefer classic, simple sports cars or modern performance machines, you're bound to find the Cayman thrilling. There are four models in the Cayman lineup for 2016: the standard Cayman, the Cayman S, the Cayman GTS, and the GT4. The primary distinction is one of power, though there are also differences in standard equipment. The base Cayman produces 275 horsepower from its 2.7-liter normally aspirated, flat-6; the Cayman S uses a 3.4-liter flat-6 that makes 325 hp. At the top of the standard Cayman lineup is the GTS, which gets a 340-hp version of that same 3.4-liter engine. A 6-speed manual transmission is standard on all models, with the 7-speed paddle-shift dual-clutch PDK gearbox an available option. There simply isn't a Cayman in the lineup with ho-hum performance numbers; they're all quick, and in each model these rev-happy flat-6 engines build power progressively and predictably, delivering additional control or passing power needed for a downshift. In base form, the manual-equipped Cayman reaches a top speed of 165 mph and hits 60 mph from a stop in 5.4 seconds; the PDK transmission cuts the 0-60 mph time to 5.3 seconds, or 5.1 seconds with the Sport Chrono package in Sport Plus mode. For the Cayman S, the manual gearbox rates a top speed of 175 mph, dashing to 60 mph in 4.7 seconds; the PDK cuts that to 4.6 seconds, or 4.4 seconds with the Sport Chrono package. The manual version of the Cayman GTS can hit a top speed of 177 mph and hit 60 in 4.6 seconds, while the PDK version uses the standard launch control to hit 60 in 4.5 seconds. As for the GT4, it's a lean, focused road racer edition, coming with a 3.8-liter flat-6 delivering 385 hp. Drive goes to the rear wheels via the aforementioned 6-speed manual, which gets dynamic gearbox mounts to minimize the oscillations and vibrations of the entire drivetrain. 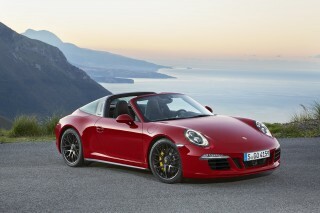 The latter is usually available as part of Porsche’s Sport Chrono Package. The GT4's 0-60 mph time is just 4.2 seconds and top speed is 183 mph. And, should your skill level be up to it, you’ll be able to lap Germany’s Nürburgring in a time of 7:40, which is comparable with times set by the 997-series 911 GT3 and even Ferrari’s 430 Scuderia. To aid the handling, the suspension has been lowered by 30 millimeters compared to the already-low stock model, and the some new body additions help produce significantly more downforce. These include three pronounced inlet openings at the front and a large fixed rear wing. The Cayman GTS ups the performance without the GT4's decided sacrifice in comfort. 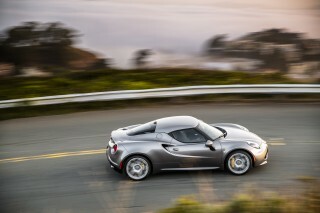 The GTS includes a sport exhaust, adaptive suspension, the Sport Chrono Package, and larger wheels. 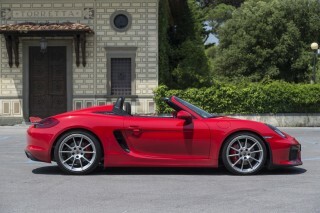 It's also worth thinking of the GTS as something of a value package; it takes the Boxster S and adds more power, various visual cues, and about $14,000 in what would normally be options, all for about $10,000 more than a Boxster S.
The Cayman has adopted electric power steering in this generation; it's light and accurate, and incorporates a lot of lessons from the 911's unit. There's definitely not as much feedback as a hydraulic unit, but it's nicely weighted and likely the best in this class—complementing the superb dynamic poise of this car. Weighing around 3,000 pounds, the Cayman range is light by modern standards. This is reflected in part through the steering (the mid-engined nature puts less weight on the front tires), and in part through the general feeling of nimbleness the Cayman exhibits in any turn. It also helps the relatively modest power output generate impressive acceleration, both from a stop and from a rolling start. The 2016 Cayman is a rather compact two-seater, yet it has excellent sport seats and great cargo space. Not very many sports cars are truly zones good for tall people; but the 2016 Porsche Cayman is one of them. There's ample leg room, head room, and shoulder room for taller and larger occupants; and seats aren't just comfortable but supportive in a way that holds you in your place in corners and keeps your back feeling fine after hours on the open road. Actually there are four available seat styles, although even the base seats are comfortable. The driver's seat and steering wheel are widely adjustable to suit a wide range of body sizes and types as well. There's not much gear-storage space in the cabin—only small door pockets and a compact center-console bin—but the rear hatch area and the front trunk offer good space for gear that doesn't need to be accessible during the drive. For a relatively simple sports-car—albeit one with the Porsche badge—the Cayman has a truly impressive sports car. Porsche offers a number of trim upgrades to meet customization needs, including wood, carbon fiber, aluminum, and Alcantara. Just be ready to pay a little more—like a five-digit price tag, collectively, to get some of these upgrades. Footwell lighting and a rear cargo net are no longer standard on the Cayman, but its base-level trims have definitely moved more upscale in its current generation. The latest Cayman, like its Porsche Boxster sibling, is much quieter overall than its predecessor, though tire noise still makes its presence known at freeway speeds. In the Cayman things like gear whine a bit more here—it's the normal effect of hatchbacks, but worth considering if cross-shopping the two. The center console houses a high-resolution, 7.0-inch infotainment touch screen—the Porsche Communication Management system, including audio, navigation, some car-specific settings. A grid of buttons below the screen also offer direct access to various aspects of the Cayman's cabin systems. On some models, there's also a circular screen in the rightmost gauge pod, which can display navigation directions, audio information, trip computers, and other helpful items. There aren't any crash-test scores for the Cayman, although it's flush in high-tech safety features. The Cayman is a relatively low-volume, expensive sports-car family, and because it's essentially a niche vehicle it hasn't been crash-tested by either the NHTSA nor the IIHS. But it's most certainly one of the safer picks you could make in this class of sports car. The Cayman's aluminum-intensive structure is among the most advanced on the road, engineered for rigidity and strength while remaining light. Safety equipment is plentiful, too, as the Cayman includes front, head, thorax, and knee airbags, plus pre-tensioning seat belts, side-guard door impact beams, ABS, traction/stability control, hugely capable brakes, and other safety-aiding electronics. The Cayman is likely as safe as any modern compact sports car. Outward visibility is an issue in the Cayman, because of its tapered roofline and the placement of its rear pillar. Fortunately, a rearview camera is now standard in this model, and it comes bundled with ParkAssist front and rear parking sensors. And there's one other safety asset in the Cayman that you might not have even thought of: Its excellent handling and strong brakes are together an accident-avoidance boon. Cayman prices are like those of an exotic; they can get out of control (read: almost double) if you get carried away with options and individualization. The 2016 Porsche Cayman is a relatively well-equipped car in base form. 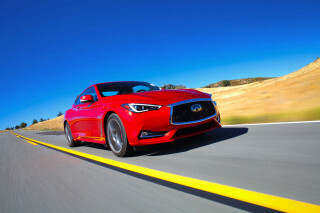 Yet when it comes to sports cars, few buyers want the base build; most want a flashier, more expressive car, one with somewhat sharper performance or plusher interior trims in other—or one that just looks a bit different. For that, the Cayman offers a long list of packages, a la carte options, performance equipment, and special appearance options. Its standard-equipment set includes a wealth of convenience and luxury items: rain-sensing wipers; electric-adjust heated exterior mirrors; cruise control; two-way power adjustable sport seats; a 4.6-inch high-resolution instrument cluster display; a 7.0-inch touchscreen infotainment system; and Bluetooth audio and phone connectivity. Options include an upgraded audio system; a six-disc CD/DVD changer; ventilated seats; a heated steering wheel; heated seats; adaptive cruise control; a rearview camera bundled with parking sensors 14-way and 18-way adjustable memory sport seats; a fire extinguisher; dual-zone automatic climate control; and a selectable sport exhaust. There's also an 821-watt Burmester sound system available. 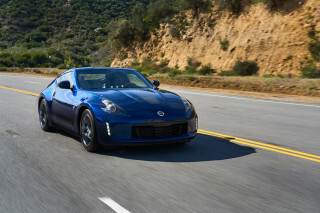 Or if real performance upgrades are what you'd prefer, there's an adjustable suspension, adaptive engine mounts, and a torque-vectoring rear end. Serious enthusiasts will almost certainly want to add the Sport Chrono package, which includes a dash-mounted stopwatch that allows the car to store and report lap times and other performance metrics for later analysis. The package also includes upgrades for other systems, depending which are installed. In addition to the standard Normal and Sport chassis settings, Sport Chrono adds Sport Plus; this and the other buttons control things such as throttle sensitivity, suspension tuning, and transmission behavior on PDK models. If that wasn't enough of an argument for getting the Sport Chrono package, PDK cars with it also get a launch control feature, which uses the transmission and a host of sensors to get optimal acceleration on a standing start—while allowing just the right amount of tire spin. The Cayman makes a good argument for practicality, with impressive mileage all around. The 2016 Porsche Cayman lineup is offered in several different performance levels; and while each performance level higher returns somewhat lower gas-mileage numbers, the base Cayman is surprisingly fuel-efficient. In base trim, the Cayman is EPA-rated at 20 mpg city, 30 highway, 24 combined with the manual gearbox, or 22/32/26 mpg with the 7-speed PDK dual-clutch automatic. 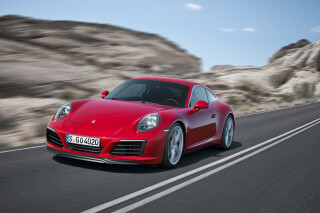 Cayman S models, and their larger-displacement engine earn 20/28/23 mpg with a manual or 21/30/24 mpg with the automatic. Go for the most powerful Cayman, the GTS, and you'll get ratings of 19/26/22 mpg or 22/31/25 mpg with the automatic. The lean, super-high-performance Cayman GT4, offered with a manual transmission only, earns just 18/23/20 mpg.